Biography of Dutch Realist Genre-Painter of Haarlem School. One of Holland's best genre painters, Jan Steen, though born and trained at Leiden, must be regarded as an honorary member of the school of Haarlem, for he came under its influence, adopted its technical methods and there painted his best pictures, including some of the greatest genre paintings of the period. He is a link between the older and younger genre painters, less objective than, say, Adriaen van Ostade (1610-85) and Gerard Terborch (1617-81), less sentimental than the Mierises. In his particular style of Dutch Realism, Steen possibly gives himself too unreservedly to his subject matter, somewhat neglecting pictorial, in favour of human, expression. His themes are usually invested with his own humorous, moralizing or satirical comment. He can at times play the showman, tweaking the beholder's elbow lest he miss something. Behind his pictures one feels the genial and quizzical man. No painter of the Dutch Baroque has studied the relations of children with grown-ups with more insight and charm. He conveys infectiously the animation of games and work and family festivals with eager participants, and he catches equally well some exquisite and unexpected aspect of a solitary figure - as that glimpse of his fair wife about to put on a stocking. Almost alone of Dutch Old Masters, he is fully aware of the comedy played between doctors who are half quacks and pretty women who are imaginary invalids. His was a widely roving eye and sympathy. Such mobility of temperament is hardly Dutch, as it was hardly Dutch to remain a good Catholic. The Dutch, who, after all, adored him, had their revenge in loading his legend with all the peccadillos and some of the sins. Here legend has probably made too much of the fact that he was generally in straits and normally convivial. No wastrel can have painted in less than thirty years of activity over five hundred carefully finished pictures. He was born at Leiden in 1626, studied with an otherwise unknown painter named Knupfer, at twenty was transiently enrolled as a student of letters in the university, soon went for a short stay at Haarlem, where he inevitably came under the influence of the Halses and Molenaers, and at twenty-two, 1648, was admitted as a master in the painters' guild of Leiden. The next year he was working at The Hague, where he married the fair Margaret van Goyen, daughter of the famous marine and landscape painter Jan van Goyen. Margaret's gracious form appears in many of Jan Steen's pictures. Before this time he had painted a few coarsely drastic pothouse pictures, probably under the influence of Frans Hals (1582-1666) in this vein. The father-in-law was a disturbing acquisition - an excellent and successful painter, he frittered away his gains in speculating in town lots and tulip bulbs. Evidently painting ill maintained Jan Steen's rapidly growing family, for in July of 1654 we find him renting a brewery at Delft for five years. Two years later the father-in-law died, leaving nothing but debts. Still a year later his own father, on whose security the lease had been drawn, came to the rescue of the brewery business from Leiden, saving it from bankruptcy. Jan was probably an absentee manager at The Hague. From about 1660 to 1671 Jan Steen painted at Haarlem. This is the moment of his prime and of his best pictures. In 1669 his wife, Margaret, died and a year later the apothecary seized all the pictures in Jan Steen's house and auctioned them publicly to cover a bill of ten gulden. After this chagrin Jan Steen moved back to his native Leiden, where, in 1672, he was licensed as a tavern keeper. The next year he married the widow, Maria van Egmont. His remaining six years seem to have passed in relative tranquillity. Some money probably came with the widow, and he himself had excellent personal qualifications as a host. He died in 1679, only fifty-three years old. The instability of Jan Steen's character is reflected in his fine art painting, which is of a very uneven quality. In general, his elaborate compositions with many persons are, though carefully studied in details, crowded and confused as compositions. His best pictures are those in which the comedy is played by two or three figures. All this suggests that he improvised rather than thought out many of his works. The earliest genre-style oil paintings by Jan Steen represent bad company without attenuation. The joyous aspect of intoxication is the theme of the Revelers; its beastly aspect, that of Resting Up. Neither is particularly good, though the latter has beauties of illumination, but both illustrated the theme with a drastic and truth-telling emphasis which we shall not find again till the time of William Hogarth. The Menagerie, 1660, was painted either at the end of his stay at The Hague or soon after his move to Haarlem. It shows him quite at his best. The exquisite figure of the seated little girl, who offers a bowl of milk to a lamb, dominates the large space. A bald-headed work-man coming in from the right with a basket of eggs, and a dwarf at the left and higher up the steps, beam upon their little queen with a courtierlike pride and affection. The platforms above and below the presiding figure are animated by domestic fowl of every decorative sort, all studied in their character from life. There is a peacock on a blasted tree to the right, and above the archway through which one glimpses between trees a moated castle, a white dove soars. Everything is considered in composition - the dark and light areas, the contrast of the obliquely presented rectangle of the pool with the formality of the arched portal. And yet the picture has the unexpectedness of a vision; one is afraid to look at it too intently lest it vanish or become something else. A similar triumph in the visionary vein is the Bedroom, at Buckingham Palace, London. It is dated 1663. One looks through an arched doorway whose dark mass serves as a frame, beyond a lute and an open music book on the threshold, to a room shimmering with straw-yellow and pale-blue stuffs, where on a bed a pretty young woman, his wife, dressed in a yellow, furred coat and a blue skirt, sits with crossed bare legs, reaching down a fine hand to draw on a stocking. Again there is a sense of surprise and revelation, as if one had had the good luck to walk past this door and happen on this gracious apparition. Jan Steen is rarely at the level of these two pictures. Indeed, he is best known for his pictures of large groups, family festivals, busy inn courts - so many documents of Old Holland at play. One of the earliest is Prince's Day. The birthday, November 14, of the future deliverer of Holland, William of Orange, was celebrated by the common folk, who rightly saw in him their champion against the wealthy patricians. What we have in this picture is rather a patriotic rally at an inn than a family affair. In this animated composition of some twenty figures the eye finds few points of rest. One may say that three pictures are arbitrarily juxtaposed - the group at the right behind the bald-headed man who, burlesquing a knightly act, kneels with a wooden sword before an amused young woman and an offish little group; the fine young pair at the left centre; the card-players at the left. There is some suggestion of Peter Bruegel, whose pictures Jan Steen must have known, and the comparison suggests the superiority of Bruegel's linear and flat painting, for this sort of subject, over Steen's atmospheric tonalities. Again, the big caldrons and platters in the foreground seem put in to fill an unexpected void, without plan. The defects of this picture are found in all of his more elaborate compositions. His best groups are less populous and on a smaller scale. Entirely winning is the painting of his own family about 1663. Except for two old people engrossed with a little girl, the rest, to the setter dog, are listening with pleasure and perhaps a shade of ridicule to the earnest piping of the eldest son. The light falls in handsomely, picking out faces, headdresses, tablecloth, massive copper kitchen utensils on the floor, and a hanging wicker bird cage which relieves effectually the general gloom of the upper part. Of very similar attractiveness is St. Nicholas' Day, where the chief motive is a roguish little girl refusing to show her presents to her mother. The various attitudes and dispositions of the celebrators are admirably caught, and the whole picture yields the intended sense of decently convivial merrymaking. Another typical example of this kind of picture is the Flemish Feast. It shows at their best, Steen's animation and ability in catching transient expressions and postures - if perhaps just a little over-egged and overcrowded. Of the pictures of this class a puristic criticism would be inclined to observe that they are merely illustrations, overstress the human interest, offer too many competing attractions. We won't argue this point, beyond remarking that if these be mere illustrations and narratives, then few story-telling pictures have an equal truthfulness, vivacity and charm. In general, Jan Steen is more regardful of pictorial unity in subjects with few figures, such as the Fighting Card-Players, where the quarrel releases a little avalanche of plunging figures and falling furniture; the Card-Players, Buckingham Palace, London, one of Steen's sparsest and neatest compositions, in which everything is as clear as in a Bruegel. Bad Company, takes up with finer artistry the moralistic motives of his early pictures. The disheveled debauchee slumbers heavily, with his head on the lap of his richly dressed lover, who guards him carefully while another frail fair one daintily hands over his watch to the rapacious proprietress of the house of pleasure. Dim in the left background a violinist soothes and continues his sleepiness. The figure group, whether in characterization or composition, is one of Jan Steen's best. It expresses moral disorder in an orderly way, quite as the richly-frocked courtesans simulate gentility. Jan Steen, however, has been so concerned with his moral lesson, which he makes very explicit, that he has treated the interior, which must have had its own character and interest, most perfunctorily. The most popular Jan Steens are the doctor and patient pictures, of which in his last years he made about half-a-dozen. The most accessible are at Amsterdam, The Hague and Munich. Nobody at the time, except Moliere, grasped that curious blend of diplomacy, charlatanism and shrewd common sense that medical practice had to be in the seventeenth century, and nobody has equalled Jan Steen in showing in the bedside manner the doctor's consciousness of the comedy he has to play. Perhaps the finest of the doctor series is Love Sickness. The invalid, sweetly relaxed in her chair, charmingly attired for the visit, fully aware of her feminine attractiveness, the courtier-like physician considering whether a compliment will go farther than a pill, the excellently placed and patterned accessories, such as the lute hanging silently beside the curtained bed - all this is the last word both in fine picture-making and in covert social satire. Hardly inferior is the Doctor's Visit. Indeed, this picture, in the touching confidence of the pretty patient which enhances both the solicitude and the inner worry of the doctor, has a more amusingly involved psychology. But the accessories are less harmoniously disposed, while the sympathetic spaniel in the foreground is sentimentally intrusive. 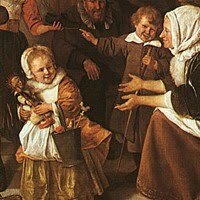 The companionableness of Jan Steen's 17th century Dutch painting is so obvious that any critical summary, beyond the analysis of his pictures, already given, seems superfluous. It is also unnecessary and ungracious to emphasize his artistic inferiority to such Dutch little masters as Brouwer, Ostade, Vermeer and Terborch. Jan Steen died in 1679, at fifty-three, probably reluctant to leave the life which had never failed to interest and amuse him. Works by Jan Steen can be seen in the best art museums across Europe, notably the Rijksmuseum Amsterdam.